Frankerkonge 741-768. Søn af Charles Martel, fader til Charlemagne. Jog lombarderne ud af Norditalien og bidrog således til dannelsen af Pavestaten. When his father Charles Martel died in 741, Pepin III and his brother Carloman succeeded as joing Mayors of the Palace of Austrasia. In 746, Carloman abdicated and became a monk, leaving Pepin to rule all of Austrasia on his own. 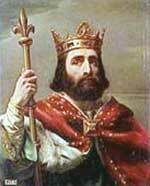 In 750, Pepin received papal permission from Pope Zachary to take the Frankish crown from King Childeric III. In 751, Zachary formerly deposed Childeric, and Pepin became the first Caroliginian king of the Franks. In 753, Pope Stephen went to Gaul to affirm Pepin's crown. In 755, on Stephen's wishes, Pepin attacked the Lombards of Italy who were harrasing the Roman See, and peace was made. The next year, the Lombard king again marauded near Rome, was again defeated, and again made peace with Pepin. That year, Pepin promised the Church Frankish protection, thus breaking ties with the Eastern Empire that were only needed for Italian safety. In 760, Pepin and Duke Waifar of independent Aquitaine started a war which lasted many years. In 764, both sides were tired, and the war took a one year break. Pepin launched a final campaign against Aquitaine in 766 with full force, Aquitaine was defeated, and Waifar and his family were executed. By 768, the year Pepin died, Aquitaine had been completely conquered.